Italian translator; lived, probably at Capua, at the end of the thirteenth century, if Steinschneider's supposition that Samuel was the father of the physician Solomon of Capua (MS. Turin No. 42) be correct. 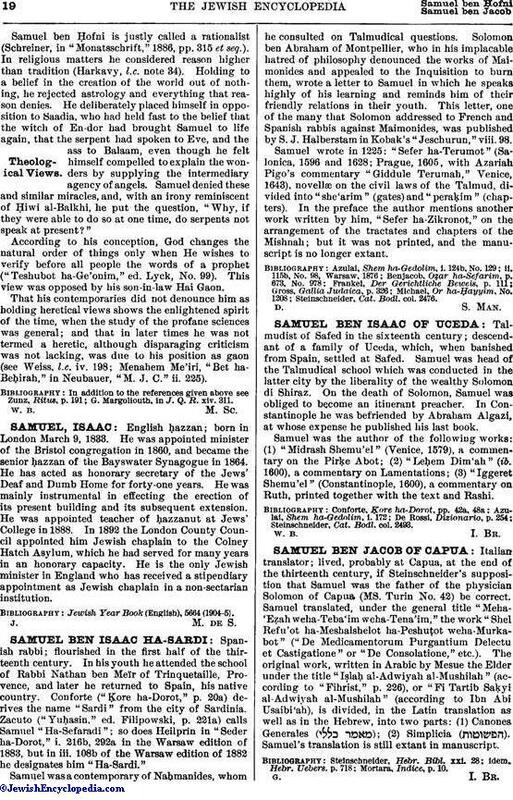 Samuel translated, under the general title "Meha-'Eẓah weha-Teba'im weha-Tena'im," the work "Shel Refu'ot ha-Meshalshelot ha-Peshuṭot weha-Murkabot" ("De Medicamentorum Purgantium Delectu et Castigatione" or "De Consolatione," etc.). The original work, written in Arabic by Mesue the Elder under the title "Iṣlaḥ al-Adwiyah al-Mushilah" (according to "Fihrist," p. 226), or "Fi Tartib Saḳyi al-Adwiyah al-Mushilah" (according to Ibn Abi Usaibi'ah), is divided, in the Latin translation as well as in the Hebrew, into two parts: (1) Canones Generales ( ); (2) Simplicia ( ). Samuel's translation is still extant in manuscript.